These perfect little bite size cookies are so simple to make. Really, so easy! And sometimes, smaller is just better.. so you don't feel guilty for eating 28 in one sitting. Fist make your Royal Icing and mix the different colors you want. Then line away! I used a #1 tip to line these because of their size (on bigger cookies, I often use a #2 tip). Once all the cookies are lined, go ahead and flood. Use a toothpick to pop any bubbles and to drag the icing to edge of the cookie. While the cookies are still wet, add any designs you want! I did polka dots, XOXO, hearts and dipped some of them in white sanding sugar.. really the possibilities are endless! After you've decorated all your cookies, let them dry for about 10 hours. 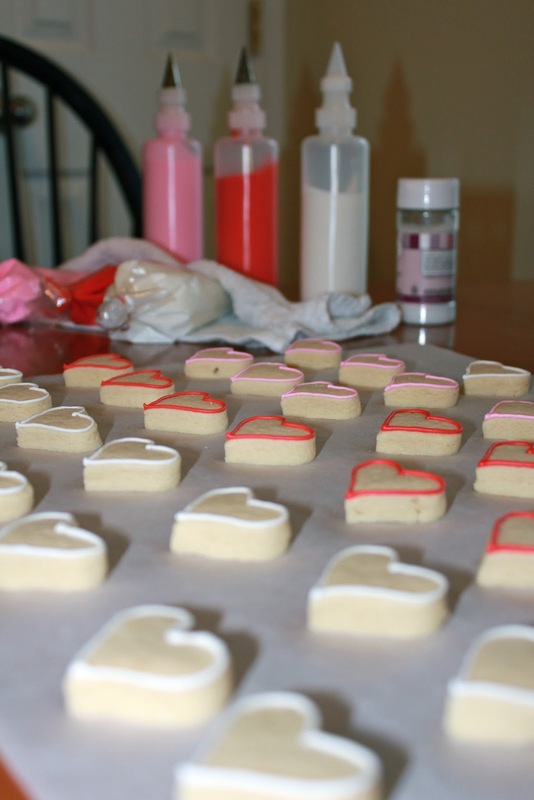 And you've got yourself some perfect little Valentine's Day cookies! I gave mine as gifts and put them in a jar with white tulle tied around it. So cute (and yummy)! Another Valentine post coming soon! If you have any questions on technique you are welcome to email me! If you'd like a tutorial on a certain method, just let me know and I'll see what I can do!